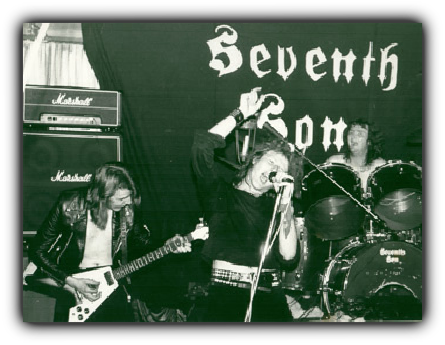 Seventh Son was put together by brothers Kev and Bri O’Shaughnessy in 1980. The idea for Seventh Son was hatched in the King George Hotel in Barnsley, which in the 70’s and 80’s, was the hangout for Barnsley's ‘different’ crowd who listened to the pubs excellent jukebox pumping out Zeppelin, Purple, Floyd, Hendrix, Bowie, T-Rex, Pistols, Clash, Damned etc. 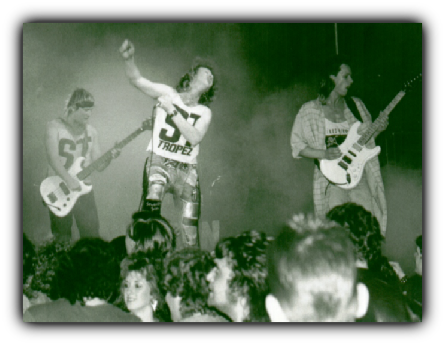 The Punk explosion had stirred people into forming their own bands as Seventh Son became part of metal's answer to Punk 'The New Wave of British Heavy Metal' (or N.W.O.B.H.M). The band recorded their first demo at Streetlife Studios in Barnsley in July '82. The band now felt ready and strong enough to record their first single Man in the Street and was released in December 1982 on the band’s own Rising Son label gaining reviews in Kerrang! A change in the bass guitar department occurred in April ’83 with current bassist Rick Gregory from Sheffield joining the band after seeing an advert in Virgin Records in Sheffield. The band were now invited to record their first session for Sheffield's ‘Hallam Rock Show’ after the radio shows producer Colin Slade had heard the bands first demo. The first session was broadcast in April 1983 with the band going on to record two further sessions for the station in 1984 and 1985 the bulk of the material recorded can be heard on the album ‘Immortal Hours’. In 1984 they recorded their next single, the double ‘A’ side ‘Metal to the Moon / Sound and Fury’. The non stop gigging continued with the single again being reviewed in Kerrang!, Sounds and Metal Forces. In 1986 the Seventh Son track Stage Crazy saw the light of day on a Yorkshire band’s compilation entitled ‘Torn in Two’ released on the Torment label. A deal was secured with South Yorkshire label Music Factory in 1986 with a single Northern Boots being released in the autumn of 1987. After working on an albums worth of material for the label a tour of the South of France was completed in the Summer of 1987. The single had gained the band much media attention appearing in the Daily Mirror newspaper and on Yorkshire Television’s Calendar news programme. A concert at Barnsley Civic Hall in November ’87 was filmed and released on video under the title ‘Alive by Night in Yorkshire’. Partly due to the album not seeing the light of day in England (an American label King Klassic had been interested before the band signed to Music Factory) and contractual difficulties, this lineup fractured in 1988. Kev emigrated to Australia after a support slot with the Dog’s Damour (Nottingham Mardi Gras) and a farewell gig at Barnsley Civic Hall in October 1988. Bri kept the band going with Rick on bass and various guitarists and drummers, going on to release a twelve inch 4 track E.P. Entitled ‘What More Do You Want?’ in 1989 and another 7 inch single ‘Factory Girls’ in 1991. In 1992 the band supported the legendary NAZARETH with a full house at Barnsley Civic Hall. There were further changes in the guitar and drum ranks with the band moving back up to a five piece in 1995. There was a period of inactivity up until 1999 when Iron Pages in Germany picked up on the band and released the ‘Dangerous Kiss’ album. The band were back in live action in 2000 and 2001 with Dave Fox joining on guitar. The bands next single on CD was released in late 2000 - ‘Dangerous Kiss’ (the title track from the album). The band also recorded a track for the Saxon tribute album ‘Eagleution’ in 2005. In the time between then and 2009 the band recorded 10 new tracks for their critically acclaimed album ‘Spirit World’. The band’s current line up of Bri, Rick Gregory, Dave Fox and Kev Lee on drums are currently still signed to German record label Iron Pages. The 2009 album ‘Spirit World’ can be heard and bought on this website and is also available to buy as vinyl, CD and download. They have continued to play consistently since then and have built up a new following on social media. With 2 EPs recently released, ‘Living On A Time Bomb’ and ‘See Emily Play’, and a new album in the pipeline, the band are still riding the rock juggernaut with a sound and fury!